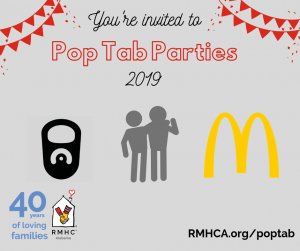 We try to do so much more for the families staying at the Ronald McDonald House than just give them a place to rest their heads. 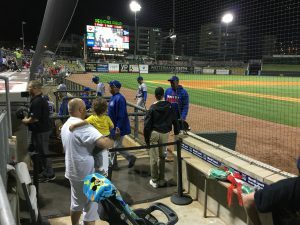 One of the ways we try to brighten their day is with Birmingham Barons baseball tickets. Thanks to the Barons and Merrill Lynch, we have tickets to most of the Barons home games. Families love being able to go to the games and enjoy some time in our beautiful city. The seats are great and the team and the staff at Regions field treat our families very well. With the 2016 season in full swing, we have already had several families enjoy the beautiful ballpark, just a few blocks away from the House in Parkside. 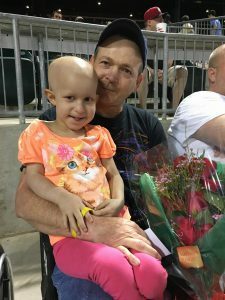 One little boy, Houston, loves baseball and it was a special treat for he and his dad to enjoy the night cheering on the Barons (and a special night for his mom to relax in a quiet room!). Another of our guests, Katie, was selected as the Sweetheart of the Game and received flowers from Norton’s Florist (pictured here). Regions Field is an amazing stadium, but to the families staying at RMHCA, it has an even more beautiful backdrop. Past the outfield is a perfect view of Children’s of Alabama. One of our guests was so excited to be able to see the game and ‘watch’ her little sister in the hospital at the same time. These are precious memories that we know each family will remember. We hope to give them experiences so that their time with us has cheerful moments to go with the hardships.